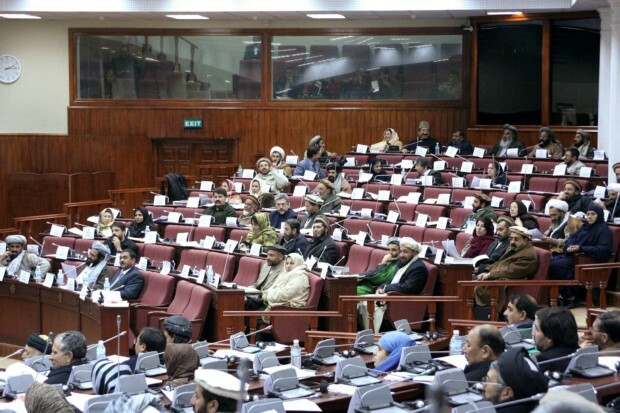 The Afghani Parliament in 2006. When it comes to the state-building effort in Afghanistan, there would seem to be plenty to criticize in the realm of poor policy implementation. However, authors Thomas Barfield and Atri Suhrke in their respective works offer sound critiques of the foundations underlying the U.S. and other international actors’ statebuilding enterprise in Afghanistan after 2001. Barfield’s Afghanistan: A Cultural and Political History analyzes the contemporary conditions and the historical and societal factors that, left unchecked by the U.S., allowed for the resurgence of the Taliban. Similarly, When More Is Less by Atri Suhrke argued that the general lack of concern paid to the crucial idea of the government’s legitimacy to Afghanis contributed to its weaknesses, unpopularity, and eventual susceptibility for targeting by insurgency. Both Suhrke and Barfield’s analyses draw attention to a core tension of Afghani political history and the contemporary efforts to state-build in Afghanistan: weighing the benefits and drawbacks of centralization, and whether rebuilding the same centralized system from Afghanistan’s past could bring security and stabilization to its present. At the end of the civil war period, the Afghani people’s willingness to engage with state politics, their understanding of the negative ramifications of disunity, and the relative security felt by each ethnic group and their entrenchment in their respective geographic areas set a cautionsly optimistic tone for the initial international efforts to state-build. Barfield emphasizes that this sentiment came from the long, traumatic years of the civil war period, and a general desire from the Afghani populace to return to a semblance of normalcy and peace. That tone would certainly not last. The world powers spearheading the state-building project decided to re-implement the model of governance used in years such as 1842, 1880, and 1929, by putting a Durrani Pashtun back in charge of the state, while also reviving the highly centralized state that had been the Iron Amir’s legacy. Western actors attached very few innovations for this contemporary reimplementation, in spite of the fact that Afghanistan had just been through years of unrest, civil war, and foreign occupation and was largely an irrevocably changed environment. Barfield criticizes this lack of consideration given to any new possibilities for or innovations on the Afghani government system: “Perhaps because Afghanistan appeared so backward to outside observers, no thought was given to devising a new type of government for this changed situation.” Within Afghanistan, the governmental debate was curtailed by the prevailing dominant post-civil war psyche: anti-federalists argued that decentralization could provide an opening for those looking to dissolve the state altogether, and equated the stance with ethnic chauvinism and rural conservatism. Barfield also states that decentralization supporters believed that “[t]he diversity of Afghanistan argued for a federal system, especially because a century of highly centralized rule from Kabul had been so detrimental to the region.” Barfield himself seems to support this idea, as local actors acquiring more of a stake in local administration could have kept some regions’ antipathy towards the more distant Kabul leadership at bay. Furthermore, the Afghani government lacked a monopoly on force and had to deal with illict economic structures providing an alternative to state authority. International forces were the de facto coercive presence in the state, rather than the Afghani national army, as other international actors sometimes opted to fund private militias to fight insurgents instead. Additionally, Suhrke argues that the opium trade “could not be harnessed by the state but remained in the ‘shadow economy,’” and thus remained a “vast, illegal structure of power…that undermined the legitimacy of the state.” Likewise, the strong dependence on foreign aid created “extreme dependence, weak local ownership and corruption,” contributing to the growth of a “rentier state” system that made Afghanistan vulnerable to a lack of democratic accountability held by the centralized government. Afghanis — especially because of the privileged position held by private donors in Afghanistan — were sidelined from the machine running the state. Karzai, too, lacked the strong will and ability that would be needed in order to have this highly centralized, patrimonial system function as desired. The Afghani people were already skeptical about his performance, according to Barfield, and Karzai’s aversion to parties, his insistence on other opposition candidates running as individuals, and his lackluster responses to the endemic corruption that plagued his administration served to disillusion his people towards the state-building process as a whole, “weaken[ing] popular support for the government and strengthen[ing] the appeal of insurgents.” These factors contributed to the general lack of legitimacy inherent to the Afghani government in the eyes of Aghani citizens; the choice for setting up a centralized governance structure in Afghanistan was poorly complemented by this simultaneous lack of legitimacy, allowing for the Taliban to take advantage of the faultlines in the state apparatus during the organization’s resurgence. This shaky foundation of the rebuilt state clearly could not withstand the additional pressures placed upon it from the internationally-sourced efforts to reform Afghani society through modernization and secularization. The Taliban seized the moment of a fundamentally weak power structure that had alienated the Afghanis who had originally felt optimism towards a fresh start for Afghanistan. Had a more thorough attempt been made to fully develop for the state a sense of legitimacy that would be meaningful and significant to not just the international community but also to the inhabitants of Afghanistan’s many disparate provinces, centralization could have worked out; barring that, perhaps a more critical look at the basic question of whether a centralized government would actually suit Afghanistan’s people well in their current, contemporary context could have led to the creation of a new, stronger system of governance in Afghanistan. Barfield, Thomas Jefferson. Afghanistan: A Cultural and Political History. 9th ed. Princeton: Princeton Univ. Press, 2012. Suhrke, Astri. When More Is Less: The International Project in Afghanistan. New York: Columbia University Press, 2011. Thomas Jefferson Barfield, Afghanistan: A Cultural and Political History, 9th ed. (Princeton: Princeton Univ. Press, 2012), 278. Astri Suhrke, When More Is Less: The International Project in Afghanistan (New York: Columbia University Press, 2011), 141.